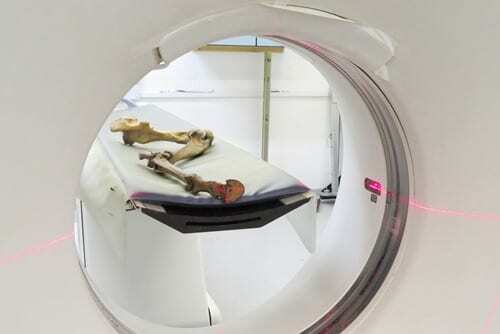 Working with conservator Nigel Larkin, the Royal Veterinary College (RVC) and the Bartlett Manufacturing and Design Exchange (B-made) at the UCL Bartlett School of Architecture, the nineteenth century skeleton has been rebuilt using twenty-first century science. 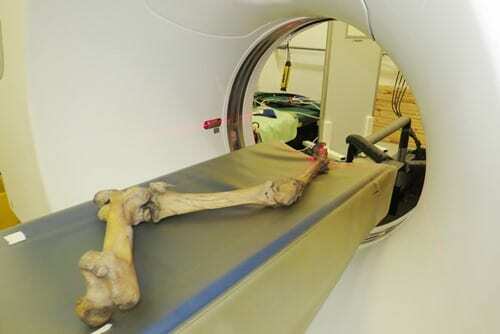 The remaining right hind leg was scanned in a CT machine at RVC, a precise mirror-image of the resulting data was then created, perfectly replicating the missing left leg on the screen. 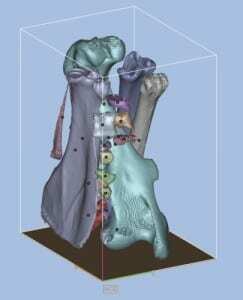 This computer image was then modelled in solid nylon using a 3D-printer at B-made, to recreate the bones of a long extinct subspecies. 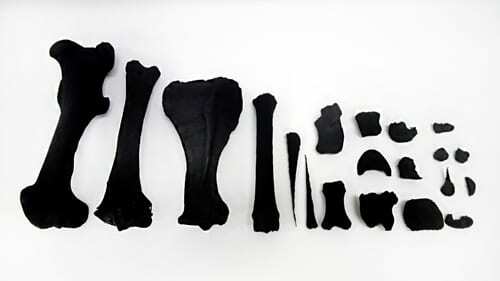 Nigel Larkin then articulated the printed bones to make the historic skeleton complete once more. The same was true of the right shoulder blade, which is also missing (and now restored in nylon). The reproduction of the missing leg was the final step in a major undertaking to restore this invaluable specimen. 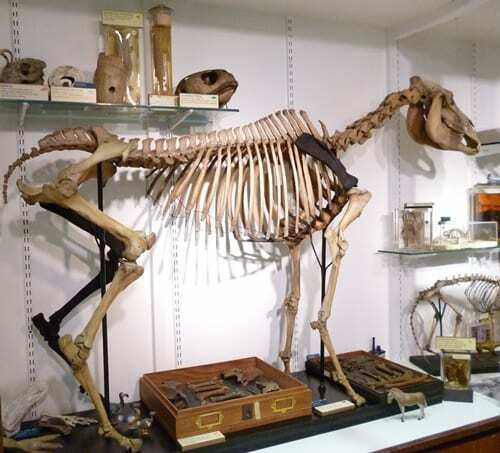 As part of the Bone Idols project, the quagga skeleton was completely disassembled and cleaned of over 100 years of ingrained grime (the Museum is one of the oldest in the country and used to be lit by oil lamps). 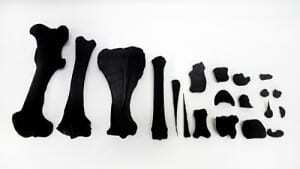 Its breast bones had been oozing black fatty deposits, which have now been removed. You can read about all the work it took to repair this skeleton on an older post. The skeleton was first mounted onto an iron frame in 1911, with five other skeletons at a cost of just £14. The neck was on upside down and the legs didn’t fit into their sockets. Since then the spine had sagged under its own weight. The project has rebuilt the quagga in an anatomically correct position on a skeleton-friendly frame. Because of its age, the quagga was in a pretty poor state, particularly for such an irreplaceable object. Through our Bone Idols project, we have worked with Nigel Larkin, a specialist bone conservator to restore the skeleton to ensure its long-term survival in the Museum. It will now be enjoyed by visitors, students and researchers for decades to come. The new leg also makes the whole skeleton more stable. There are many parts to the quagga skeleton’s story (much of which was coverered by this (different) Guardian piece). Its significance was only confirmed in 1972 when the Grant Museum’s two “zebra” skeletons were closely studied. This one was verified as an extinct quagga, while the other was downgraded to donkey. Throughout the Museum’s history these two specimens seem to have been confused a number of times. Newly uncovered archives suggest the quagga arrived in 1911, thirty years after the species became extinct. Where its leg went is another mystery, and the archive has letters from previous curators to other museums trying to track it down. The quagga now stands on four feet again, even if one of them was built by computers. To date the Museum has raised over £20,000 to fund the Bone Idols project. 31 of the 39 specimens have so far been conserved, including the Museum’s largest skeleton – the (hornless) Indian one-horned rhino skeleton, the skull of a giant deer and endangered chimpanzee skeletons. Thanks so much to all of those who have supported the project so far, and Nigel Larkin for conserving our large and complicated specimens and arranging the scanning, to Renate Weller and Laura Porro from RVC and Richard Beckett and Martyn Carter at B-made.